As a member of the Salem Radio Editorial Board, I frequently record audio commentaries to run on Townhall Review and on the radio network. 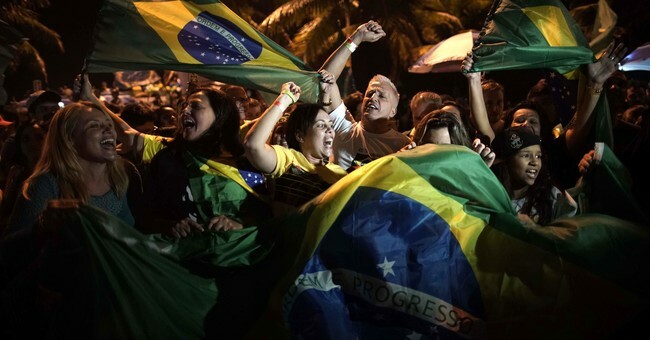 Top of my list this new year was to bring attention once again to the remarkable political/cultural/religious shift going on right now in Brazil. Due to evangelical Christian growth in this very large nation, a shift has occurred moving it from socialist authoritarianism to free-market populism. This is more than just an economic shift, it is a geopolitical shift as well, most notably a shift in attitude toward Israel. The first thing the new Brazilian President did after his inauguration was to turn and hug Israeli Prime Minister Benjamin Netanyahu. That—and the fact that Netanyahu was there at all—is extraordinary. It was Bibi’s first trip to anywhere in South America. Adding to the sense of solidarity with Israel was the sound of the Shofar horn being blown by a rabbi. Bolsonaro has made friendship with Israel a cornerstone of his administration: He, too, has promised to move their Israeli embassy to Jerusalem. Our friend George Gilder has argued in his book The Israel Test that someone’s attitude towards Israel reveals their attitude about entrepreneurship. Because of his approach to market capitalism, his approach to Israel and the Middle East and his efforts to deal with cronyism and corruption, Brazil’s stock market has been the best performer in the world. And you can listen to the audio here. Bolsonaro is predictably being labeled far right and anti-liberal democracy by the left press. Nothing could be more wrong. Far right, but embraces Israel and Judaism? Anti-liberal democracy, but moving towards free markets and with strong majority electoral support? Please share the truth farther than the lies are being spread.